As part of the undergraduate studies the students in the faculty of aerospace engineering are required to participate in a yearlong design project of an aerospace system. 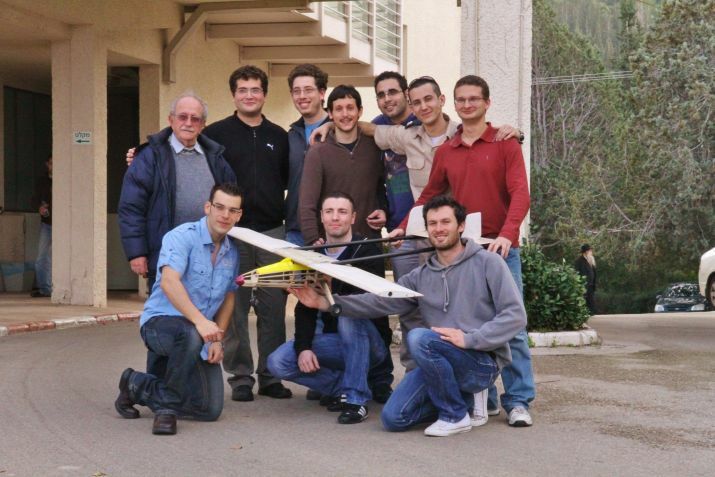 In our project we were required to design an unmanned aerial vehicle (UAV) for instruction in flight tests and demonstration of flight test techniques. The tests will be based on the subjects studied in aerospace engineering such as stability and control, instruments, performance and propulsion. We started off by reviewing all the main configuration aspects of UAV design and we made a list of a lot of possibilities for each aspect. We narrowed this list to 3 main configurations of UAVs that we thought were the best fitted for the design specification, using methods of conceptual design we evaluated the 3 configurations, and we found the configuration most suited for this project. We made a comprehensive survey of similar UAV in order to estimate the weight of the TeachAir UAV. We used design specification in order to define the main characteristic of the TeachAir UAV. As part of the design process we placed high emphasis on aerodynamic issues including optimization of the airfoil, wing geometry, flaps, tail and ailerons and the drag coefficient was calculated. Another topic that we constricted on was propulsion and flight performance, this included finding the required power needed to meet design specifications and the engine and prop that can deliver them. After producing the propulsion system the flight characteristics and flight envelop were found. Using the characteristics we found we chose off the self components in order to comply with the design specification and planned the internal arrangement in order for our platform to be stable in all flight scenarios. We then gave our attention to the design of the control system, performing stress analysis on critical parts and building a smaller scale model. During the design of the control system all of the control and stability were calculated, in addition, a simulation of six DOF was made and two controllers of pitch angle, and angle of attack due to elevator deflection were designed. Furthermore a thorough stress analysis of the forces and moments in the wing and in the main landing gear was made. Following the analysis the geometry and material of the wing beam and the landing gear were determined. Besides theoretical work we also designed and built a small scale model which has the same aerodynamic properties as the TeachAir UAV. The process includes designing a CAD model and executing it in the faculty’s laboratory. During this project we experienced the design process of a UAV aircraft including preliminary and specific sub system design, the entire process taught us a lot about the design aspects of aircraft and the considerations that need to be made during this process.